Now the search for wrecks began. I started chatting with the local fishing community about possible wreck sites. Unfortunately theses are kept very secret as they provide some very good fish and the guys were wary of me wanting their marks even though I assured them it was purely for diving only. Eventually after many evenings of Captain Morgan rum I was able to get more potential marks for wrecks. These I plotted onto a chart, loaded the GPS and headed out to sea to confirm the possibility of them being wrecks. This is the not so glamorous side of searching for wrecks. Many long hours are spent out at sea driving over potential marks with the sonar. Many times there is nothing near the mark or the fisherman supplying the mark has written it down incorrectly for you or used a different set of datum in the setup. All you can do is a methodical search of the area in the hope that something shows up on the sounder. But the reward of finding something significant is fantastic. 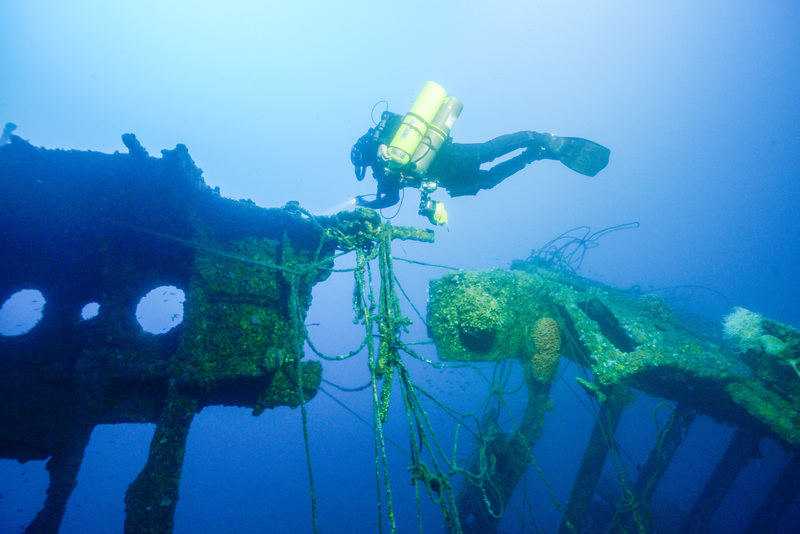 The next wreck we found was the “John Ross” wreck in October 2012. Again not its real name but a mark we got from our fishing friends who used the John Ross building as a landmark. We found some interesting reef structures on the initial dives we did on this site, but no wreck. I had found some features on the sonar about 100m from where the fishing marks were. This was now our sixth dive in search of her. We dropped into the water and were greeted by 30 to 40 m viz. We hit the bottom at 65m but besides some reef, nothing else resembling a wreck was to be seen. The current at this stage was pumping and we decided to go with the flow. After 25 minutes we started our accent to our deep stop at 45 meters. Allan had his reel out and was just about to deploy his Delayed Surface marker buoy. As I looked down one final time I spotted some metal. At this stage we were at 50m and below us lay the remains of a ship at 65m. The boiler in the middle was clearly visible and I turned to Allan to say I was going back down to tie my reel to it and send up a marker buoy so that we could get a proper GPS Mark. The top of the boiler was at 55m and I attached the reel to the boiler with some bungee and a double ended clip. The idea is that once the boat had marked the spot we could tug on the reel, the bungee would snap and all that we possibly lose is a double ended clip. I attached the reel, sent up the marker buoy and turned to look for Allan. Nothing! So what now? I decided to go up the line that I had attached to the wreck. I did have a second reel and a Yellow emergency buoy, but I didn’t want to send this up as there was no emergency at this stage and I didn’t want to alarm the skipper and support divers on the boat. I headed up the thin line of the reel and as I got shallower the current got stronger. I was hoping the whole time that the bungee attaching the reel to the wreck would not break! I got to 30m and could see my DSMB underwater just above me. The drag I created from holding onto the line had pulled it down. Great, now the boat and surface support had no idea where I was. No problem. I had a smaller orange DSMB in my dry suit pocket along with a smaller reel I kept for backup. I looped the line through the DSMB that was at 20m and sent up the smaller buoy. Once I felt the buoy was on the surface I let out a lot of line, tied the reel on to the line attached to the wreck and continued my ascent. I wasn’t going to lose this wreck. By this stage the current was incredible. It took all my strength to hold onto the line. Imagine my disbelief when I met my second DSMB at 5m…. the current had pulled it under again! Ok, time to get the finger reel out and the emergency DSMB. 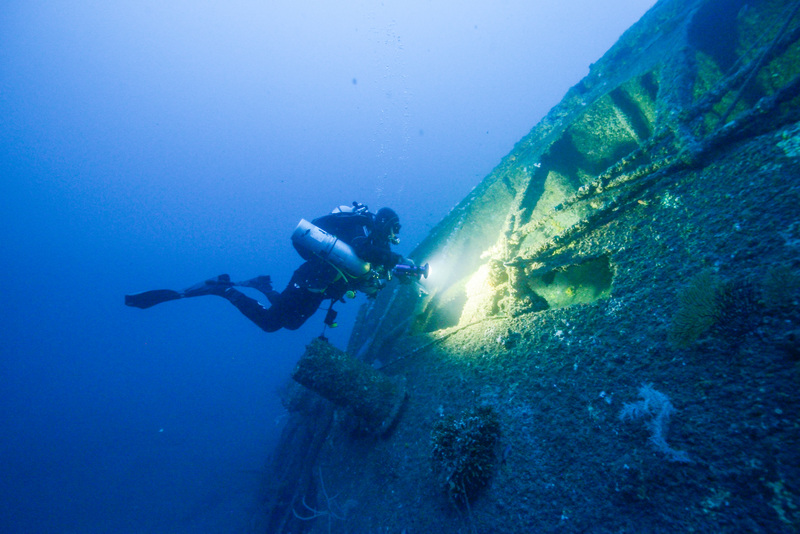 One of the potential dangers we face in exploring these deep wrecks is the ships entering and leaving Durban Harbour. We have drills and procedures in place to warn the divers on their deco stops if a ship is headed our way and the skipper on the dive boat can’t get it to alter course. At this stage I wasn’t sure where Allan was, where the boat was and none of the support divers had joined me as yet. So with one hand holding onto the line and the other busy getting the emergency DSMB and the finger reel ready, I managed to drop the reel. The current was so strong at this stage that it caused the finger reel to swirl around my legs and wrap them together. What a sight. Me holding onto a line flapping about like a flag in the wind, the finger reel wrapped around my legs and still with 10 minutes of decompression to do. At this stage Bradley Wright who was my support diver had actually dropped into the water onto my bubbles. However the current was so strong that with me holding onto the line attached to the wreck he had not been able to swim to me. He said later that he had got as close as 2 meters to me and had finned as hard as possible but could not reach me. I did not see him, so engrossed in my own problems. So I waited out my deco in this position thinking how stupid it was to get myself into such a mess. Once the deco was up I used my line cutter to free myself and surfaced holding onto my bright yellow emergency DSMB. 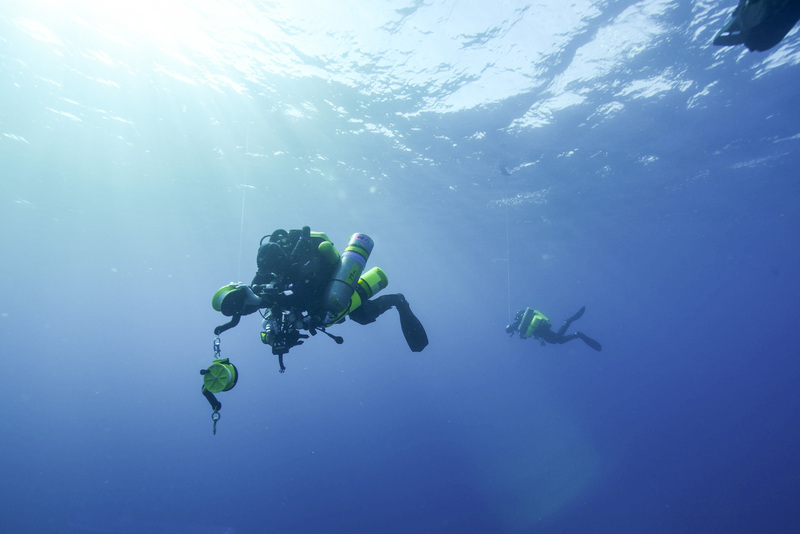 I could not see land, I could not see the boat, I could not see the support divers and I could not see Allan. I wasn’t too stressed as I carry a Nautilus Lifeline radio. I was just about to take it out when I saw a fishing boat coming towards me. As they arrived they asked if I was ok or needed help. I said I was fine and so they said ok and that they had seen the dive boat and would head off to it and tell them where I was. So there I was, all alone again. Anyway the boat came back with Allan, Brad and all the support divers on board and we were able to mark the wreck some 600 meters from the original coordinates that we got from the fishermen. What a day. After several dives to this wreck we are almost sure that she is the Sir Gordon This vessel arrived in East London in 1890. She was in service as a rock breaker, then a grab-dredger. Later she was sold to a treasure syndicate. After 55 years of service, she was scuttled off Durban. Her dimensions and shape are correct but we have not been able to track down a photograph of her. So if anyone does have a picture, please scan and email a copy so that we can definitely confirm she is indeed the Sir Gordon.